October 2015 issue on sale now! | What Hi-Fi? October 2015 issue on sale now! 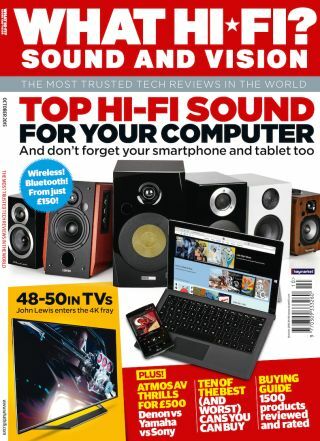 Budget AV receivers, on-ear/over-ear headphones and affordable Bluetooth stereo speakers are just some of the highlights from the October issue of What Hi-Fi? magazine. Throw in a 4K TV head-to-head, and desktop DACs, and you've got an issue that can't be missed! The £500 AV receiver market is the sweetspot for balancing showstopping performance with spec and affordability. We've pulled together three of the biggest hitters at this price from Sony, Denon and Yamaha, to see which should make its way to the heart of your system. Our regular features serve up some quality kit, with First Tests showcasing Cambridge Audio's new CXU universal Blu-ray player, Denon's D-M40DAB micro system and Audiolab's 8300CD CD player. Astell & Kern's Jr portable high-res music player provides sonic thrills, while there's a first review of Dali's new Opticon range of speakers, with the Opticon 1, a £500 entry-level standmounter, getting the in-depth treatment. Meanwhile, this month's Temptations include a stunning turntable from VPI and an awesome pair of active standmount speakers from ATC. And don't forget, you can download the digital edition of the magazine directly to your smartphone or tablet at any time. Happy reading! Best JBL Bluetooth speakers: Which speaker should you choose?